This is the industry's most innovative exhaust removal system. The Vacuum Holster’s unique design exceeds typical exhaust removal systems with an unsurpassed ease of use, more professional appearance, and lasting value. The Original Vacuum Holster offers simple and easy operation for service technicians. It’s simple to attach the tailpipe adapter to any vehicle, and its rubber boot and attachment device will not scratch vehicles. Its innovative design uses the suction of the exhaust fan to assist in retracting the exhaust hose into the Hose Holster storage cylinder. 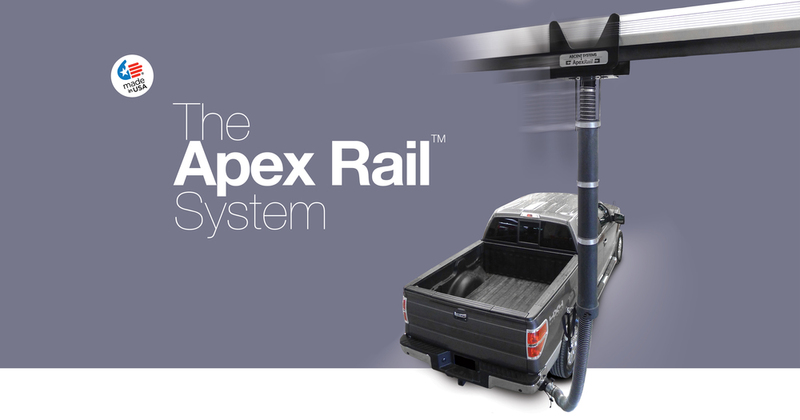 When used in conjunction with the Apex Rail, the Vacuum Holster is mounted on a sliding trolley that can be moved along the length of a horizontal rail. This approach enables fewer hosedrops while still covering the maintenance area. The Apex Rail provides the best appearance, flexibility, and functionality. With hundreds of dealerships and automotive shops serviced to date, we understand the unique needs of these facilities. All of our automotive systems are designed for versatility, aesthetic quality, and efficiency—all while being easy-to-use and budget-friendly. Whether your application is a national fleet, over-the-road trucks, or a custom application with high capacity requirements, we design and service all types of fleet/diesel facilities. We understand the health risks posed to diesel service technicians and have decades of experience creating adaptable fleet systems. Military applications, with their wide variety of vehicles, require a broad range of solutions. We have installed numerous applications, both new and retrofit, for Army TEMFs, Air Force Bases, and National Guard maintenance buildings. These systems often involve high CFM and high temperature equipment and exhaust fans. Allow your technicians to start the exhaust fan from each individual bay. Save time and energy by enabling your exhaust fan to be turned on/off wirelessly from each service bay. This feature helps ensure the exhaust fan is run only when needed, saving energy and prolonging the life of the motor. Includes wireless transmitter and receiver. In addition to the Vacuum Holster, Ascent Systems offers hosereels, which using a spring rewind mechanical to retract the exhaust hose around a drum. The hose reel can either be fixed-mounted with the service area, or it can be incorporated into an Apex Rail system, with moving hose reels. Ideal for service areas with bridge cranes, boom arms also provide easy placement and movement around parked vehicles, as well as an extended reach (up to a 40’ radius) of coverage. The Vacuum Holster (or conventional hosedrop) is mounted on a trolley that slides back and forth along the length of the arm. Standard arms lengths are 10’, 15’, and 20’. What type of facility do you need exhausted? ©2016 Ascent Systems, Inc. Specifications herein are subject to change without notice. Proud to be Made in the USA.